What does "This transaction is part of a recurring series" checkbox do in the Virtual Terminal? Recurring transaction are stored in the Virtual Terminal and a merchant is able to charge those customers as part of a recurring series. 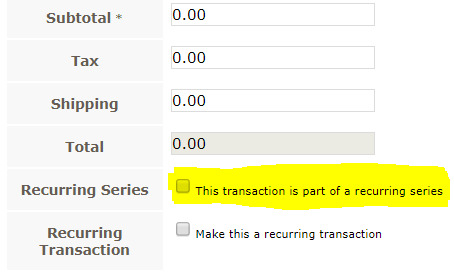 The transaction page of the Virtual Terminal has a checkbox labeled "This transaction is part of a recurring series". Check this box to ensure that the transaction you are processing is recorded as part of a recurring serie. This checkbox is an indicator that is passed to the cardholder's bank. It identifies the cardholder as a frequent customer of the business. It does not impact any recurring customers that are set up in the Virtual Terminal. How do I send email confirmations to customers?